K2: a brief, impersonal name given to a remote mountain on the border of China and Pakistan. Peaking at 8,611 meters, it is the second highest mountain on Earth. Its name, originating from a notation in the Great Trigonometric Survey, is appropriate for such an inaccessible and challenging mountain in the Karakoram range. Italian climber Fosco Maraini described it as "just bare bones of a name, all rock and ice and storm and abyss. It makes no attempt to sound human." It was with full knowledge of these odds that on the morning of August 1, 2008, 25 climbers from different international expeditions set out to reach the peak. It was sunny, and after nearly two months of inclement weather, conditions were perfect for a summit attempt. Yet just 48 hours later, 11 of those climbers had perished. The Summit, a documentary by Nick Ryan, unravels the mystery of what happened on those treacherous slopes, resulting in a body count double the macabre statistical prediction. The film is a riveting tale of determination, courage and altruism, in extremely demanding, hazardous conditions. It is also story of selfishness and selflessness, of little mistakes and tragic consequences, of fate and heroism. On the phone from his native Ireland, the director told Documentary what inspired him to make the film: "I'm not a climber," Ryan explains. "What drew me in was when I listened to the statistics—particularly the one-in-four statistic—and thinking to myself , Wow! That's a peculiar form of insanity. Why would anybody put their lives at that much risk to reach a summit that had already been reached? I was drawn in by that." K2 is a mountaineer's mountain—not for dilettantes, nor for affluent "tourist" climbers. But despite the experience of the climbers, early media criticism of the disaster emphasized the lethal convergence of factors—a crowded mountain, language barriers, summit fever, poor preparation and reliance on fixed ropes. A brief outline of the tragedy: a delay in submitting meant the climbers made the descent in the dark, after nightfall. An avalanche killed one climber and snapped the fixed ropes along a steep bottleneck that the mountaineers were relying on to make their way back to the camp. With the fixed ropes gone, the rest of the climbers were stranded high up on the mountain, and forced to bivouac in the open overnight, in the "death zone," above 8,000 meters. The following day, Sherpas set out to rescue the survivors, leading them down the mountain—but another avalanche struck, killing part of the rescue party. "On the Internet, when I started doing my research, there was a lot of derision poured on these people," Ryan continues. "I can't say I wasn't somewhat of that belief at the time." Reminiscing about the origin of the film, Ryan recalls, "Ostensibly the start of the film was to address some of the issues in the media where the Sherpas were not getting any kind of credit for anything that had happened on the mountains. A lot of the media reported on how the Westerners had saved their lives and survived out in the open, and so forth." But in reality the Sherpas had to tie people on ropes to help them down. "None of the Western climbers on ropes would tell us that," Ryan explains. "[They] never volunteered the information that they were all tied together like children and brought down the mountain from the summit. It was really to address some of those issues; I started investigating what had happened from that perspective." However, Ryan maintains that he "did not want to start this out like every other documentary about this subject matter, giving you the very dry statistics. I wanted to show the excitement of these people going, because it is exciting. And all of a sudden, showing how very quickly this turns." The embodiment of the love of climbing, and at the heart of the film, is Ger McDonnell, a gregarious and experienced mountaineer who was on his second attempt at reaching the peak. He succeeds, becoming the first Irishman to summit K2, but on the descent, after a night of numerous avalanches off the serac, his body was never found. As Ryan began to piece together testimony from the various parties involved—McDonnell's trusted Sherpa, Pemba, and his expedition team leader, Wilco—it became clear that the Irish mountaineer had tried to rescue injured Koreans who were caught in the ropes. He had broken the unwritten code of the mountain: leave injured or disoriented climbers for dead, for survival depends on self-preservation. What is unique about the film, apart from the arresting cinematography, is the seamless transition between the actual footage of the 2008 ascent and shockingly real re-enactments. These were shot on the Eiger in the Jungfrau region of Switzerland, and then the alpine background was altered via green-screen technology to the correct Himalayan landscape. When asked about the re-enactments, Ryan elaborates: "For certain people reconstructions are a dirty word, but from the very beginning I [knew] this was a challenging tale. The re-enactments basically cover areas that were not filmed by the climbers, essentially because they were busy trying to survive. So there were large tracts of the story that would have either been just talking heads or stills or repetition, and what we wanted to do was engage the audience and keep them utterly focused on the story. "For me, if we were going to do that, it was going to look like we had filmed this on K2," Ryan continues. "We green-screened the background in from real photographs given to us by the climbers. And I also went to K2 myself in 2011 and flew with the Pakistan military and filmed all those opening shots with a Cineflex camera. "There are green-screen elements in it because the Swiss Alps look nothing like the Karakoram," Ryan explains. "It was very frustrating for Robbie [Ryan] as a DP, because we would turn around and I'd see a mountain and I would say, 'We'll have to put a green screen,' and he'd wonder, 'What's wrong with those mountains?' and I would say, 'They're not the right mountains.'" However, Ryan clarifies, there were some ground rules: "I never mixed real footage with reconstruction footage. When you go into a reconstruction, it's a reconstruction until the very end. I never used the shot from archive within it." Apart from the standard funding difficulties in making a documentary, a mountaineering film offers a unique set of challenges. "Making a film is like climbing a mountain, so making a film about climbing a mountain is twice as hard!" says Ryan. 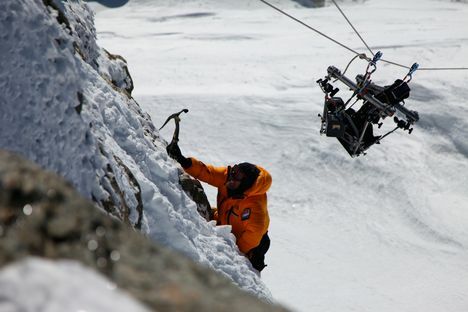 "We filmed at 3,700 meters in the Alps. You're just so lethargic at the best of times. Some of the crew never acclimatized; they were always halfway down the mountain." "It was kind of misleading because we just did three days. We filmed two little sequences. But the reality is that when you have four or five actors who are not really climbers, and even if they are climbers, when you are filming in that situation, health and safety is of primary concern." Filming moved at a glacial pace, Ryan adds. "And because we had to rely on the weather, the schedule had to stay quite fluid as well. All of a sudden, everything is slowed down 10 times." The director dealt with the restrictive budget with remarkable inventiveness: "Some of the people playing the other climbers were actually ski instructors who were around at the time. We would literally just look for people there and then, because we could not afford to hire people and fly them in. The actors playing the Koreans were actually Tibetan cooks from Interlaken. Jehan Baig [one of the Pakistani porters] was played by one of our grips. We were using the crew! The guy who plays Fredrik Strang is one of our line producers." Ryan also delves into the past for his film, interviewing Walter Bonatti, a member of the 1954 Italian expedition that completed the first successful ascent of the mountain. But the success was shrouded in controversy: Bonatti, the youngest and fittest climber on the team, was in charge of bringing oxygen canisters to his teammates. He was forced to spend the night exposed to the elements, with no tent or sleeping bag, when his teammates deliberately moved the camp to a higher location to ensure he would not join them on their summit bid. He survived -58ºF temperatures, yet after the expedition he was falsely accused by his teammates of using the oxygen to survive his bivouac, and for decades, was unjustly vilified by the climbing community. Explaining his decision to include this storyline in the film, Ryan comments, "I started doing research, and I read Walter Bonatti's book [The Mountains of my Life], given that he had been on the first successful expedition. He wrote so beautifully and when I read the story there were a lot of parallels, [in] what the mountain does to people. In his particular story, his life was ruined by Compagnoni and Lacedelli—[they branded him] a traitor—for having ambition and for being a very talented climber. What that said about the difference between now and 50 years ago is [that] now we have different climbing gear-better and lighter, better weather protection-but the mountain will still kill you in a heartbeat." British mountaineer George Mallory famously quipped, "Because it's there," when asked why he wished to climb Everest. In addressing the issues of "summit fever" and poor decision-making on part of the climbers, Ryan responds, "They had been there 67 days before making the summit push. They are there and looking at a big 300-foot cliff of ice melting. The weather is perfect, you've been there for over 60 days and you are six hours away from your destination. And this is your last chance to do this. Are you going to turn around?" Ryan's film delves into the peculiar characteristics of top tier mountaineers: ambition, obsession, confidence and blind optimism—a belief that they can defy the murderous odds. Watching The Summit reminded me of a quotation of renowned mountaineer Anatoli Boukreev, on his memorial on Annapurna: "Mountains are not stadiums where I satisfy my ambition to achieve; they are the cathedrals where I practice my religion." The Summit opens in theaters nationwide October 4 through IFC Films.